Anti-retroviral therapy to treat HIV/AIDS is monitored in South Africa on a large scale. Flow cytometry is combined for haematology (CD45), immunology (CD4) and viral-load linked CD38 assay. Recorded at NHLS-SA laboratories, Johannesburg, these modern methods are cost-efficient with heightened local internal quality control, serving as role-models for resource-limited diagnostics. Lawrie, D., Janossy, G., Roos, M., Glencross, D. K. Comprehensive & Cost Effective Laboratory Monitoring of HIV/AIDS: an African Role Model. J. Vis. Exp. (44), e2312, doi:10.3791/2312 (2010). We present the video about assisting anti-retroviral therapy (ART) by an apt laboratory service - representing a South-African role model for economical large scale diagnostic testing. In the low-income countries inexpensive ART has transformed the prospects for the survival of HIV seropositive patients but there are doubts whether there is a need for the laboratory monitoring of ART and at what costs - in situations when the overall quality of pathology services can still be very low. The appropriate answer is to establish economically sound services with better coordination and stricter internal quality assessment than seen in western countries. This video, photographed at location in the National Health Laboratory Services (NHLS-SA) at the Witwatersrand University, Johannesburg, South Africa, provides such a coordinated scheme expanding the original 2-color CD4-CD45 PanLeucoGating strategy (PLG). Thus the six modules of the video presentation reveal the simplicity of a 4-color flow cytometric assay to combine haematological, immunological and virology-related tests in a single tube. These video modules are: (i) the set-up of instruments; (ii) sample preparations; (iii) testing absolute counts and monitoring quality for each sample by bead-count-rate; (iv) the heamatological CD45 test for white cell counts and differentials; (v) the CD4 counts, and (vi) the activation of CD8+ T cells measured by CD38 display, a viral load related parameter. The potential cost-savings are remarkable. This arrangement is a prime example for the feasibility of performing > 800-1000 tests per day with a stricter quality control than that applied in western laboratories, and also with a transfer of technology to other laboratories within a NHLS-SA network. Expert advisors, laboratory managers and policy makers who carry the duty of making decisions about introducing modern medical technology are frequently not in a position to see the latest technical details as carried out in the large regional laboratories with huge burdens of workload. Hence this video shows details of these new developments. The modern scientific efforts in the area of biomedicine lead to practical benefits including the introduction of efficient diagnostics for infectious diseases. High quality and fast diagnostics are needed because of the danger of disease spread due to global travel and the current devastating impact of viral and bacterial infections in the poverty stricken areas of the globe1. In resource poor countries treatment of HIV positive patients with anti-retroviral therapy (ART) has been successfully introduced2,3. The protocols of ART are currently based on (i) the serological tests for HIV+ individuals, (ii) the once-daily combinations of genetic drug regimens used as 'first-line' ART and (iii) the CD4 and/or viral load assays to decide when to start ART. The protocols are, however, changing as the scope for ART can now be further widened with more relaxed guidelines to initiate ART earlier at higher CD4 counts 2. Importantly, increasing the number of HIV+ patients who receive ART at higher CD4+ cell/μl of blood may even slow down the spread of HIV despite the current lack of HIV vaccine 4, 5. Thus HIV infection is poised to become a chronic disease in increasing numbers of survivors, requiring organized medicine more than ever but the poor state of laboratory medicine in Africa may still remain a barrier of effective health care 6. There are voices to emphasize that the provision of short-term grants does not provide sustainable solutions 7-9, and the HIV-related grants supplied by Western countries at the current scale cannot continue forever 8,9. In 2008 USD 15.6 billion was spent on AIDS programs in low and middle income countries, and about 50% of these were from external, including North American, sources. The calculated trends show that this expenditure is to increase up to 2-3 times higher level, and that the epidemic will still be with us in 2031 unless there is a change in the current overall approach 9. Thus African countries must contribute by better HIV prevention and wiser cost-savings 9. Here we suggest that the most recent inventive 'role models' for routine work will be established and introduced in resource-poor countries (e.g. in Africa or India). These are the areas of the globe where the scientists will learn to fully benefit from the current international support and then to utilize their skills to further improve every-day technology, by contributing to a global development. In western medicine the diagnostic activities in large academic centres and hospitals are frequently "departmentalized", i.e. separate "zones of interest" may exist for the different disciplines leading to a fragmentation into haemato-, viro-, retroviro-, bacterio-, sero-, immuno-, and cytological laboratories instead of conducting an unifying approach using a minimal set of multidisciplinary diagnostic assays in an infectious-disease laboratory. In addition, the diagnostic tests can also be far too complicated and costly. Clearly, such services would need to be better coordinated but these unifying efforts are unlikely to come entirely from western directions. Consequently, the leading laboratories and institutes, such as the National Health Laboratory Service (NHLS-SA) in cooperation with University of Witwatersrand in Johannesburg, South Africa, are facing an the extra task to further develop, modify, re-focus and improve their cost-effective diagnostics based on modern technology. In the current video we describe flow-cytometric methods to monitor the anti-retroviral therapy (ART) in HIV-infected patients. This technology is presented step-wise in six modules for a combination of relevant haemato-, immuno-, and virological assays in a single tube, combined with essential internal quality control (QC) to ensure reproducibility of testing 10. The uses of monoclonal antibodies employed here are all scientifically fully established. The CD45 reagent is for white blood cell counts 11-13, combined with CD4 to enumerate the "helper" T-lymphocytes which are the primary targets for HIV 12-14. It is a "constructive trick" that in the same tube the CD38 activation marker is detected on CD8+ T cells as a HIV viral-load (VL) related assay 15-17. In order to emphasize the South-African contribution, we point out that these concepts and their cost-effective practical combinations have all been worked out in NHLS-Wits collaborations based on leading western technologies 10,12,13,16,17. These assays, carried out in combination, are going to be needed for the proper monitoring of patients who are undergoing long-term ART. When the cost-efficiency is scrutinized, this coordinated flow-cytometry technology is proving to be economical 16,18,19. These single-tube assays represent cost-saving over their western variants and over the similar tests done by separate instruments and/or carried out as different surrogate tests using other methods. These savings are itemized in the discussion. For the acceptance of this basically simply technology, which utilizes four-color flow cytometry in a single tube, it is essential to show the technical steps in a video format. Expert advisors, laboratory managers and policy makers who carry the duty of making decisions about introducing modern medical technology are frequently not in a position to see the latest technical details as carried out in the large regional laboratories with huge burdens of work load. Hence this video shows details of new developments that have introduced in South Africa to optimize the workflow for testing >1000 clinical samples each working day 10,13,16,17. 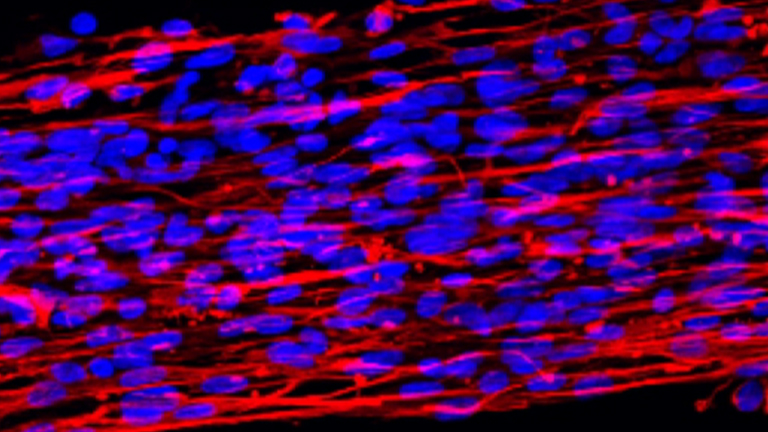 The tests were carried out by 4-color flow cytometry but the assays can also be performed using 2-colors in two parallel tubes (see below). The Beckman-Coulter XL-MCL, a cytometer of stable fluidics 21, is used but the same technology may also be applicable to other cytometers. The technology described handles large daily workloads of ~800-1100 samples/day10,13. Daily in-house maintenance is cleaning perform twice each day: on start-up and on completion of the last patient sample. This includes the flushing of vacuum lines and acquiring Clenz (5% sodium hypochlorite; BC, Miami, FL). Also, at the end of each 30-tube carousel Clenz and distilled water is run through the system to minimize protein build-up. At daily start-up the vacuum- and pressure readings are checked. It is confirmed that the background counts remain acceptable (<100 events in 100 sec). After running the first blood sample it is established that in an aliquot of sheath fluid the carryover is <1%. Then laser alignment and fluorescence sensitivity are monitored daily using a sample of FlowCheck 21. It is observed that the Mean Channel Numbers are consistent (500±50) with a low variation (half peak CV values <2%). The compensation is checked weekly; FlowSet beads are plotted to see whether the mean channel values are within 1% of the preset target values 22. To visually confirm the precision on Levey-Jennings plots, the mean channel numbers and half peak coefficient of variation (HPCV) values for the four Fluorescence channels (FL1-FL4) are daily displayed. Next the accuracy of CD4 counts is confirmed at the two CD4 levels. During a PLG-CD4 test stabilized blood process controls (IMMUNOTROL) are used the low normal (450-700 CD4 cells/μl) and the low levels (100-200 CD4 cells/μl, depending on batch; ref 23). These Immunotrol values are required to be within 0.5 SD of the mean with a %CV of < 5% as requested by the international BC-IQAP program 24, UK NEQAS 25 and AFREQAS 26. It is important that with these simple organized measures as shown in the video the robust flow cytometers can maintain the required stability for both absolute cell counting such as CD4 tests and for fluorescence intensity measurements used for the activation marker CD38. This stability has recently been documented in detail 17 confirming previous studies using other cytometers 15,27. During weekly maintenance the list mode data (LMD) files are archived for future reference and this archived material is then deleted from the cytometer hard drive. Monthly maintenance includes the cleaning of reagent containers, the sheath, clenz and waste tanks. The carousel-mode sample head is cleaned while all filters are also removed and washed. This cleaning is also extended to preparation stations TQPrep and PrepPlus2 (BC, FL). The pipettes used for manual preparation are validated in-house at least every 3 months but if pipetting inaccuracy is suspected the pipette is immediately taken out of service for corrective action. Six monthly maintenance is scheduled by the Beckman Coulter, SA. For the CD45/CD4 two-color PanLeucogated protocol 5 the Beckman Coulter FlowCARE kit 28 is used in a lyse-no-wash procedure (IMMUNOPREP, Beckman Coulter, FL). This kit contains CD45-fluorescein-isothiocyanate (FITC; green) and CD4-phycoerythrin (PE; orange). Flow-Count beads29 are purchased in bulk and are added to play a special operator-friendly role as known numbers of beads in a known volume are pipetted on the spot into the sample 30. This is done with the same pipetting as used to deliver the volume of blood. Thus the Bead Count Rate (BCR) in the expected range shows that the pipetting in the given sample is precisely done, as described in Module 3 below. Importantly, here the simple pipetting method, referred to as 'forward pipetting', works best, providing that the bead- and blood-volumes are delivered with the same pipette and tip and with identical handling 30 . We found that forward pipetting yielded optimal overall uniformity between laboratories, both with respect to operators achieving pipetting targets within acceptable tolerance limits and reproducibility of repeated dispensing as measured by the co-efficient of variation (%CV) 10,31,32. This method, presented at local congresses 32, is approved for use under the South African National Accreditation Scheme (SANAS, www.SANAS.co.za) guidelines. This BCR use of beads is different from the other volumetric counting methods where most frequently the lyophilized bead product such as the BDS Trucount preparations are used which contain known numbers of beads. These preparations are excellent to document the stability of the fluidics of the flow instruments by the Flow Count Rate (FCR) method 20,31. Nevertheless, the use of ready made bead-containing tubes renders the technology more complicated because here it is essential to deliver the blood volume into these tubes with utmost absolute precision. It is generally agreed that for that purpose only the "reverse-pipetting" technology is acceptable following applicable training. Our BCR method is therefore, less expensive, more informative, simpler and easier to learn -as shown in the video - when compared to the alternative similar methods 10,31,32.We also find that the operators using forward pipetting are less likely to aspirate sample into the pipette which with reverse pipetting can lead to both the damage to the internal mechanism and the need for re-calibration which is difficult in remote locations. Our BCR method also obviates the need for automated pipetting systems in the small-to-medium sized laboratories (List 1). The blood samples are always processed in Class II biohazard cabinets. In order to avoid extensive noise during filming, the video shown is a re-enactment with safe materials outside these cabinets. The PLG-CD4 acquisition protocol on the cytometers allows a time to stop at a given time limit or continue to acquire 5000 lymphocyte events to improve accuracy on samples with low CD4 counts. Monitoring bead count rates (BCR) in our system or each control sample is calculated using the formula bead events/seconds 10,13,30,32,33. The Mean, SD and %CV values are used on a spreadsheet to generate a sequence plot for identifying BCR outliers 30. These confirm the optimal operation of the three systems of pipetting, processing and analysis referred to as sample preparation verification (SPV), applied to both the samples pipetted manually or by using the PrepPlus2 automated pipetting instrument 10. 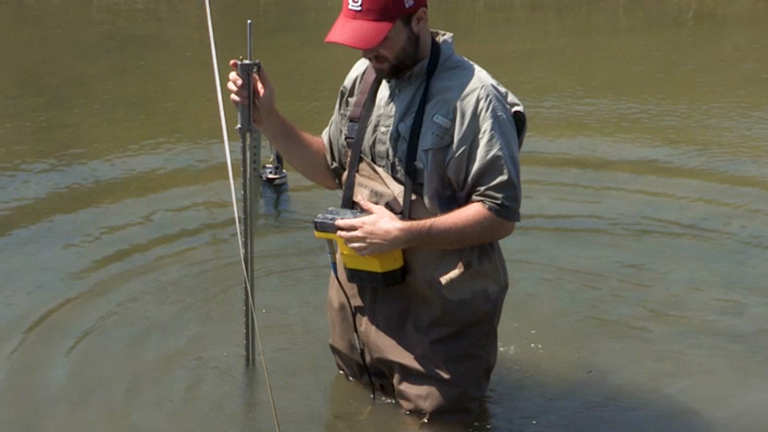 During acquisition the BCR results are directly viewed in real time on monitors. On the BC cytometers the value of mean BCR is 80±5 events/sec. We show that the aberrant BCR-s are identified and re-run before the patient results are released. The decision-tree algorithm is illustrated in Figure 1 (see also ref.10). Instrument malfunctions are indicated by fluctuations in BCR when monitored during longitudinal precision verification (LPV) to detect pipetting trends, patterns and sudden shifts10. Fluidics precision verification (FPV) is an optional in-house procedure where a single dilution of beads is aliquoted into 10 tubes for serial acquisition to confirm signs of fluidic instability on a potentially misbehaving instrument 10. For routine absolute counts in our studies a full blood count analyser LH-750 (Beckman Coulter), calibrated monthly, is used daily as a reference for white cell counting (WCC) against which the flow cytometers are compared. The CD45-generated WCC-s on the flow cytometers are also validated daily by comparison with the three levels of stabilized Beckman Coulter 5C whole blood cell controls. The acceptable limits of WCC agreement between the flow CD45 counts and full blood count analysers are <5% 10. This indicates that when the resource restrictions are more severe then in our service than one single instrument, such as a flow cytometer, seems to be sufficient to provide the clinically appropriate WCC including CD4 counts. White cell differential counts are performed on various haematological analysers which differ, particularly in assessing monocyte counts. The pattern of differential CD45 expression is a classical use of flow technology for differential WCC 11,12, 34. As the flow cytometer-derived CD45 WCC and differential counts are proven to be accurate, precise and robust, these can be routinely incorporated into the PLG-CD4 test method and also made available to clinicians at no extra cost. Abnormal CD45 patterns are noted on CD45/side scatter plots of the PLG-CD4 protocol and followed-up on a stained blood film to prompt further clinical investigation. This method detects infection (bacterial and viral), leukaemia and lymphoma on both HIV-negative and HIV+ patients 34, 35. During a routine laboratory follow-up in HIV+ patients the full blood count is frequently not requested from the haematology laboratory. Therefore the abnormal CD45 patterns are diagnostic when candidly observed in samples sent for CD4 counts. An additional advantage is that the accurate absolute CD4 count can still be made, even in patients with findings of leukaemia or lymphoma in the blood 35. Flow CD45 is well suited to standardize haematology. The haematological instruments significantly differ from each other. 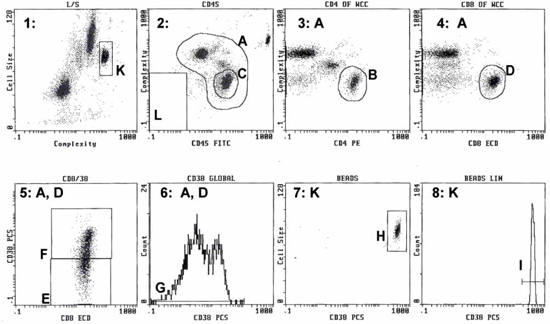 We suggest introducing the CD45-based flow cytometric quality control for the WBC differentials to compare and standardize the haematological analysers 10,36. The PLG-CD4 Protocol introduced on the Beckman Coulter XL software consists of eight dot-plots. Of these 4 are used to determine the CD4 counts and 4 are for quality monitoring 12,13. Among these, the two dot-plots shown in Fig.2 are important. 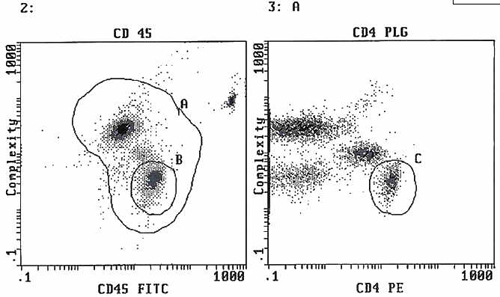 All white cells are identified using CD45 and side scatter (region A dot-plot 2) while debris, red blood cells/ghosts and platelets are ignored. The CD45+ events are then transferred to dot-plot 3 where CD4+ lymphocytes are identified by their bright CD4 expression and low side scatter (region C). Absolute CD4+ lymphocyte count are calculated from the number of events in region C and WCC (in the Flow Count calibration region F). The values for CD4% of lymphocytes are obtained from region B dot-plot 2. The strongly CD4+ T lymphocytes and the weakly CD4+ monocytes are discriminated by CD4-fluorescence intensity and scatter features without a need for using an extra CD3 T cell specific antibody in the reagent cocktail (reviewed in ref.13). CD8-CD38 staining is a part of the 4-color staining using CD45-FITC/CD4-PE/CD8-ECD/CD38-PC5. The CD4/CD45 is the same as above (Flow Care PLG-CD4), and the two extra reagents added are CD8-ECD/CD38-PC5 17. If a cytometer runs only two colors, an extra tube is added to perform CD8-FITC/CD38-PE two-color staining, using again the lyse-no-wash procedure (IMMUNOPREP, Beckman Coulter, FL). A gating strategy similar to CD4 is used to identify CD8+ T cells with CD8-ECD vs. side scatter (Figure 3). CD38 expression on the CD8+ lymphocytes is plotted as single parameter histogram of CD38-PC5 mean fluorescence intensity (MFI) vs. cell count 16,17. The CD38 MFI values are plotted sequentially for each visit of the same patient. The first visit (prior to treatment) is the 'baseline' MFI value to which every other visit of the same person's CD38 MFI is compared16. Controls and instrument stability as described in Module 1 is based on daily acquisition of Flow Check to monitor laser alignment and voltage stability. Flow Set sets the color compensation for all the four fluorescent channels (see above). Immunotrol is the 'negative' process control sample. The 'positive' controls are the monocytes in normal blood expressing 9 x 103 CD38 molecules per cell, and a known HIV+ sample untreated 17.
quality control methods standardized across 70 laboratories13, 33 with a centralized database containing standard operating procedures and training material. Laboratories in the network are helped by discussions, further training and regular audition including the scrutiny of pipetting technology 32,33. The quality assessment programme is monitored monthly. In this way, quality management is devolved regionally but high standards are maintained with the contribution of the SA-NHLS QA Department13, 26. Figure 1. 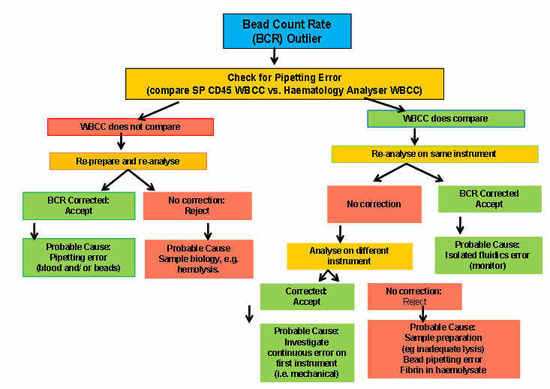 A decision tree/algorithm used when a sample tested shows an outlying result of the bead count rate (BCR). The main task is to exclude pipetting error versus intermittent volumetric failure. The diagram shows the probable causes of errors. It is also indicated that which protocol histograms and statistics are affected 10. Figure 2. An example of the PLG CD4 protocol that incorporates CD45-FITC (green; x-axis) vs. side scatter (complexity; y-axis) and CD4-PE; (orange; X-axis) vs. side scatter (complexity; y-axis). The gate 'A' is the total white cell population with the selected gate of lymphocytes 'B'. The gate 'A' is transferred to the second diagram on the right in order to identify the CD4+ lymphocytes in gate 'C'. Figure 3. The combination of CD45/CD4 panleucogating assay (in diagrams '2' and '3'; see also Fig.2) with the CD8/CD38 assay (in diagrams '4' and '6). When the total leucocytes (gate 'A') are transferred to diagram '4', here the CD8+ lymphocytes are gated on the basis of CD8-ECD ('x'-axis) and side scatter ('y'-axis; as shown in gate 'D'). Then the CD8+ cells are transferred to diagram '6' to visualize the CD38-PC5 staining intensity in a single-parameter diagram. This is shown as the parameter 'G' in diagram '6'. The mean fluorescence CD38-PC5 intensity (MFI) is recorded. On ART this value gradually decreases 16,17. In recent years the charity-driven and grant-allocated programs have helped the establishment of some excellent clinical practices in resource limited areas of the globe with high HIV burden. The ART programs have been successful in reducing the mortality and are now being initiated at higher CD4 counts 2,3. There are already indications that these new measures will decrease the spread of HIV infection 4,5, despite the lack of a HIV-specific vaccine. In our video we document that when monitoring patients on ART, these techniques can be better focused and become more cost-effective than that observed in the routine practice performed in western laboratories (List 1). Such an African-led approach may well be essential to support the upgrading of laboratory services at a time when HIV infection, treated with ART, is becoming a chronic disease. Such a monitoring of ART requires precise CD4 counting and viral-load related technology, a more demanding task than to simply perform a CD4-count for placing patients into arbitrary groups in order to assist a decision about starting ART 16. With the help of these diagnostics, i.e. using the CD8/CD38 test, it is possible to reduce the VL-related monitoring costs in >60% of the patients on ART 16,19. It is also important to emphasize that it is the CD8/CD38 test 16,17, and not the CD4 count 37, which is likely to pick up early signs of VL rebounds and/or the lack of patient compliance in taking the medication. An essential element of a coordinated cost-effective central service is the availability of a large-scale national or regional network supported by experts and academic advisers who are familiar with the technical and medical aspects of the operation. This is demonstrated by the activities of the South African NHLS network and the CD4-PLG.net training schemes 33, 36 which provide encouragement, education and quality assessment for the smaller centres and these may also include 'point-of-care' services. Importantly, the operations of central and point-of-care laboratories are complementary. While the former has the double role of providing a cost-effective large-scale service operation as well as basic/advanced training for the peripheral laboratories 33,38, the latter contributes to check the spread of ART by recruiting HIV+ patients who are eligible for ART from a larger base, including rural clinics. Here some caution is necessary because point-of-care diagnostics can be much more expensive and do not automatically guarantee accuracy 38. It is therefore sensible to retain the two-tier system and to facilitate coordination between the two tiers without allowing either arm to dwindle. In conclusion, in the field of the diagnostic monitoring of the clinical management of infectious diseases a necessary cost-saving can be achieved by apt services that use less expensive and better coordinated modern technology with a significantly improved quality 13,39. Well-organized national (and regional) diagnostic service provisions should be better supported 6-8 by avoiding a scenario when virtually all grant support is wasted on expensive and/or untried methods as soon as these are imported from rich countries without a careful pre-emptive constructive scrutiny. Similarly, a more flexible design of clinical therapeutic trials with the full involvement of local doctors and healthcare personnel should lead to the reduction of unnecessarily frequent and/or over-ambitious laboratory testing 3. This policy would give more chance to a fuller utilization of the available accurate diagnostic results in a coordinated clinical/laboratory assessment of patients on ART. These smart diagnostics could also be pioneered for the resource-poor countries 8 in the areas of tuberculosis and leukaemias using an existing familiar flow cytometric platform 40. The international patent rights for CD4 method described here are held by the South African NHLS and currently under license to BCI, Miami, Fl, USA. Special thanks are due to the National Health Laboratory Service (NHLS) of the Republic of South Africa for the national organization of the HIV related flow diagnostic services (http:\\www.nhls.ac.za and http://www.plgcd4.net). The studies featured have been carried at the Department of Haematology and Molecular Medicine, Witwatersrand University (Johannesburg, South Africa; supported by Head of Department, Professor Wendy Stevens). The authors have received no grant support for this publication from commercial companies or funding agencies . The opinions expressed are those of the authors without necessarily reflecting the views of the Institutions of the University of the Witwatersrand or the South African NHLS. UNAIDS Report on the global HIV/AIDS epidemic. Available from: http://www.unaids.org/en/ KnowledgeCentre/HIVData/GlobalReport/2008/2008_Global_report.asp (2008). World Health Organization Rapid advice: Antiretroviral therapy for HIV infection in adults and adolescents. Available from: http://www.who.int/hiv/pub/arv/rapid_advice_art.pdf (2009). Mugyenyi, P. DART Trial Team. Routine versus clinically driven laboratory monitoring of HIV antiretroviral therapy in Africa (DART): a randomized non-inferiority trial. Lancet. 375, 123-131 (2009). Donnell, D., Kiarie, J., Thomas, K., Baeten, J., Lingappa, J., Cohen, C., Celum, C. ART and risk of heterosexual HIV-1 transmission in HIV-1 serodiscordant African couples: A Multinational Prospective Study. 17th Conference on Retroviruses and Opportunistic Infections, (2010). Montaner, J., Wood, E., Kerr, T., Yip, B., Lima, V., Shannon, K., Harrigan, R., Hogg, R. Association of Expanded HAART Coverage with a Decrease in New HIV Diagnoses, Particularly among Injection Drug Users in British Columbia, Canada. 17th Conference on Retroviruses and Opportunistic Infections, (2010). Petti, C. A., Polage, C. R., Quinn, T. C., Ronald, A. R., Sande, M. A. Laboratory medicine in Africa: a barrier to effective health care. Clin Infect Dis. 42, 377-382 (2006). Brown, H. Global health: Great expectations. BMJ. 334, 874-876 (2007). Crisp, N. Turning the World Upside Down. Royal Society of Medicine Press. (2009). Hecht, R., Bollinger, L., Stover, J., McGreevey, W., Muhib, F., Madavo, C. E., de Ferranti, D. Critical choices in financing the response to the global HIV/AIDS pandemic. Health Aff. 28, 1591-1605 (2009). Lawrie, D., Coetzee, L. M., Glencross, D. K. A model for continuous quality control incorporating sample-to sample assessment of optical alignment, fluorescence sensitivity and volumetric operation fo flow cytometers. Cytometry B Clin Cytom. 78, 201-208 (2010). Loken, M. R., Brosnan, J. M., Bach, B. A., Ault, K. A. Establishing optimal lymphocyte gates for immunophenotyping by flow cytometry. Cytometry. 11, 453-459 (1990). Glencross, D., Scott, L. E., Jani, I. V., Barnett, D., Janossy, G. CD45-assisted PanLeucogating for accurate, cost-effective dual-platform CD4+ T-cell enumeration. Cytometry. 50, 69-77 (2002). Glencross, D. K., Janossy, G., Coetzee, L. M., Lawrie, D., Aggett, H. M., Scott, L. E., Sanne, I., McIntyre, J. A., Stevens, W. Large-scale affordable PanLeucogated CD4+ testing with proactive internal and external quality assessment: in support of the South African national comprehensive care, treatment and management programme for HIV and AIDS. Cytometry B Clin Cytom. 74, Suppl 1. S40-S51 (2008). Dalgleish, A. G. The CD4 (T4) antigen is an essential component of the receptor for the AIDS retrovirus. Nature. 312, 763-767 (1984). Liu, Z., Cumberland, W. G., Hultin, L. E., Prince, H. E., Detels, R., Giorgi, J. V. Elevated CD38 antigen expression on CD8+ T cells is a stronger marker for the risk of chronic HIV disease progression to AIDS and death in the Multicenter AIDS Cohort Study than CD4+ cell count. J Acquir Immune Defic Syndr Hum Retrovirol. 16, 83-92 (1997). Glencross, D. K., Janossy, G., Coetzee, L. M., Lawrie, D., Scott, L. E., Sanne, I., McIntyre, J. A., Stevens, W. CD8/CD38 activation yields important clinical information of effective antiretroviral therapy: findings from the first year of the CIPRA-SA cohort. Cytometry B Clin Cytom. 74, Suppl 1. S131-S140 (2008). Coetzee, L. M., Tay, S. S., Lawrie, D., Janossy, G., Glencross, D. K. From research tool to routine test: CD38 monitoring in HIV patients. Cytometry B Clin Cytom. 76, 375-384 (2009). Larsen, C. H. The fragile environments of inexpensive CD4+ T-cell enumeration in the least developed countries: strategies for accessible support. Cytometry B Clin Cytom. 74, Suppl 1. S107-S116 (2008). Glencross, D. K., Coetzee, L. M., Lawrie, D., Sanne, I., McIntyre, J. A., Janossy, G., Stevens, W. Longitudinal monitoring of CD38 activation can obviate costly viral load testing in 60% of patients on ART. 11th IUSTI World Congress, (2009). Bergeron, M., Lustyik, G., Phaneuf, S., Ding, T., Nicholson, J. K., Janossy, G., Shapiro, H., Barnett, D., Mandy, F. Stability of currently used cytometers facilitates the identification of pipetting errors and their volumetric operation: "time" can tell all. Cytometry B Clin Cytom. 52, 37-39 (2003). Coulter, B. Flow Cytometer Alignment Verification Package insert of Flow-CheckTM Fluorospheres. Volume PN 4276179-LA. Beckman Coulter USA. Galway. (2008). Coulter, B. Flow-SetTM Fluorospheres (Flow Cytometer Standardization Fluorospheres). Package insert of Flow-SetTM Fluorospheres. Volume PN 6607007. Beckman Coulter USA. Galway. (2007). Coulter, B. Immuno-TrolTM Cells. Package insert of Immuno-TrolTM Cells. Volume PN 6607077. Beckman Coulter USA. Galway. (2007). Beckman Coulter Hematology IQAP program. Available from: https://www.beckmancoulter.com/wsrportal/wsr/support/quality-assurance-programs/interlaboratory-quality-assurance-program-iqap/index.htm (2009). UKNEQAS. United Kingdom National External Quality Assessment Service. Available from: http://www.ukneqas.org.uk (2009). Glencross, D. K., Aggett, H. M., Stevens, W. S., Mandy, F. African regional external quality assessment for CD4 T-cell enumeration: development, outcomes, and performance of laboratories. Cytometry B Clin Cytom. 74, Suppl 1. S69-S79 (2008). Tilling, R., Kinloch, S., Goh, L. E. Parallel decline of CD8+/CD38++ T cells and viraemia in response to quadruple highly active antiretroviral therapy in primary HIV infection. AIDS. 16, 589-596 (2002). Coulter, B. FLOWCARETM PLG CD4 Reagent (CD45-FITC/CD4-PE). Package insert of FLOWCARETM PLG CD4 Reagent. Beckman Coulter USA. Galway. (2004). Coulter, B. Flow-CountTM Fluorospheres. PN 7507992-M. Beckman Coulter USA. Galway. (2007). Scott, L. E., Glencross, D. K. Monitoring reproducibility of single analysis, single platform CD4 cell counts in a high volume, low resource laboratory setting using sequential bead count rates. Cytometry B Clin Cytom. 67, 31-32 (2005). Storie, I., Sawle, A., Goodfellow, K., Whitby, L., Granger, V., Reilly, J. T., Barnett, D. Flow rate calibration: a new approach for performing absolute cell counts. Cytometry B Clin Cytom. 55, 1-7 (2003). Coetzee, L., Lawrie, D., Stevens, W., Glencross, D. K. Evaluation of pipetting methodology to assess precision and accuracy of single platform PLG/CD4 enumeration. 2nd SA-AIDS Congress, Durban, South Africa, (2006). NHLS Training Manual, PLG/CD4 Workshop. Available from: http://www.plgcd4.net/ (2008). Borowitz, M. J., Guenther, K. L., Shults, K. E., Stelzer, G. T. Immunophenotyping of acute leukemia by flow cytometric analysis. Use of CD45 and right-angle light scatter to gate on leukemic blasts in three-color analysis. Am J Clin Pathol. 100, 534-540 (1993). Mokone, G. N., Lawrie, D., Coetzee, L., Glencross, D. K. Interpretation of CD45 patterns in the PanLeucoGating CD4 test can be used for diagnosis of white cell abnormalities. Poster presentation. (2007). Lawrie, D. The wide-spread clinical uses of PanLeucoGating technology in the HIV diagnosis oriented immunohaematology laboratory. PhD Thesis, in preparation. (2010). Badri, M., Lawn, S. D., Wood, R. Utility of CD4 cell counts for early prediction of virological failure during antiretroviral therapy in a resource-limited setting. BMC Infect Dis. 8, 89 (2008). Peter, T., Badrichani, A., Wu, E., Freeman, R., Ncube, B., Ariki, F., Daily, J., Shimada, Y., Murtagh, M. Challenges in implementing CD4 testing in resource-limited settings. Cytometry B Clin Cytom. 74, Suppl 1. S123-S130 (2008). Denny, T. N., Gelman, R., Bergeron, M., Landay, A., Lam, L., Louzao, R., Mandy, F. F., Schmitz, J., Spira, T., Wilkening, C., Glencross, D. K. A North American multilaboratory study of CD4 counts using flow cytometric panLeukogating (PLG): a NIAID-DAIDS Immunology Quality Assessment Program Study. Cytometry B Clin Cytom. 74, Suppl 1. S52-S64 (2008). Janossy, G. The changing pattern of "smart" flow cytometry (S-FC) to assist the cost-effective diagnosis of HIV, tuberculosis, and leukemias in resource-restricted conditions. Biotechnol J. 3, 32-42 (2008).